Don’t buy snack bars, it’s so easy to make your own healthy snack bars! 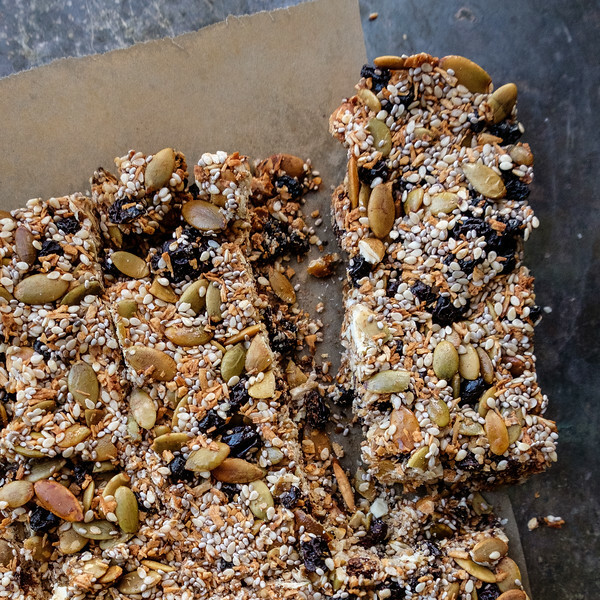 These delicious crunchy bars are sweetened with honey and full of good for you chia seeds, sesame seeds, pumpkin seeds, raisins, coconut and cinnamon. Have you gone down the snack bar grocery aisle lately? It is loaded with “healthy” snack bars. We are a society on the go and we need to have easy snacks that we can just grab and go. Store bought snack bars range in price from okay to outrageous. Many of them contain additives and added sugar. All things we don’t need. 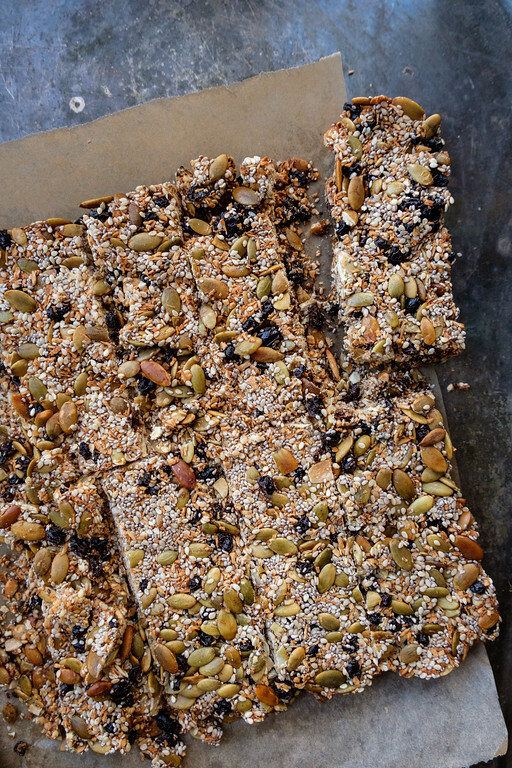 Wait till you see how easy it is to make your own healthy snack bars! You’ll never buy store bought again. White chia seeds – you can use black, the white are more attractive in a snack. Pumpkin Seeds – could also use sunflower seeds. Currants – can use raisins or small bite size pieces of your favorite dried fruit – like apples, blueberries, cranberries. Step One – preheat the oven. Step Two – combine everything – the chia seeds, pumpkin seeds, sesame seeds, dried fruit, coconut, cinnamon, vanilla extract, and honey – in a large bowl. Tip – It will be sticky, a rubber spatula makes mixing the ingredients easy. Step Three – lightly grease an 8 inch baking pan and line with parchment paper. 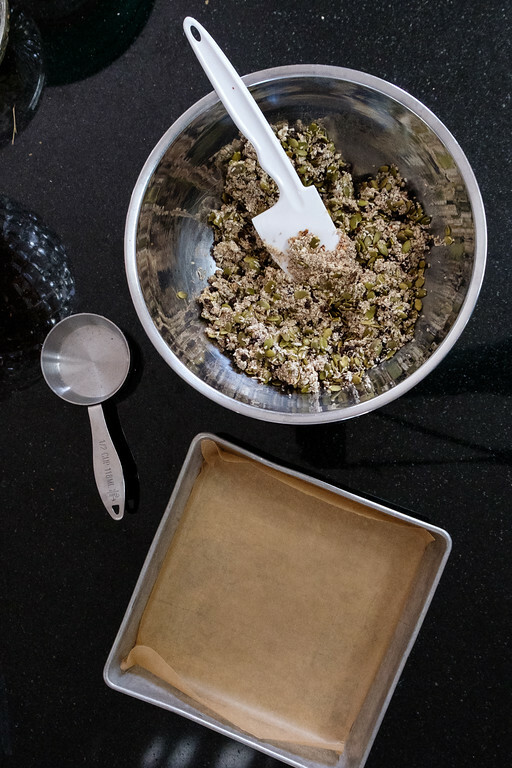 Step Four – Scoop the seed mixture into the pan. Tip – Tear off an extra sheet of parchment paper or waxed paper and lay it over the top. Press down using the back of a measuring cup or your hands. So easy! Press it down so that it’s even. Step Five – Bake for about 50 minutes, remove from the oven and allow to cool for about 30 minutes. Then refrigerate fro an hours. Step Six – Slice using a serrated knife. Store in an airtight container. Tip – if any of the bars crumble, it’s great on top of yogurt or ice cream! These bars are so good. The honey glazes everything and makes them sweet and crunchy. These healthy snacks are filled with coconut, chia seeds, pumpkin seeds, sesame seeds, and currants. Sweetened with honey! Place in the refrigerator for 1 hour. Using a serrated knife, slice into 20 small pieces. White chia seeds - you can use black, the white are more attractive in a snack. Pumpkin Seeds - could also use sunflower seeds. Currants - can use raisins or small bite size pieces of your favorite dried fruit - like apples, blueberries, cranberries. Tip - It will be sticky, a rubber spatula makes mixing the ingredients easy. Tip - Tear off an extra sheet of parchment paper or waxed paper and lay it over the top. Press down using the back of a measuring cup or your hands. So easy! Press it down so that it's even. Tip - if any of the bars crumble, it's great on top of yogurt or ice cream! This post was originally published in 2018 and updated for 2019. Your Coconut Chia Bars sound fantastic Pam! I’ve scheduled them to pin and also on the Hearth and Soul Facebook page (later today). I really like the idea of a healthy treat like this I can make myself. Thank you so much for your support of the Hearth and Soul Link Party. I hope you have a wonderful week! Your Coconut Chia Bars look amazing! Thanks so much for sharing your awesome post with us at Full Plate Thursday. Have a great week and come back soon! These bars looks amazing, I would like to have few of them right now! These look so good! I will have to put these items on my grocery list so I can make these bars! I’m inspired to try and make my own snack bars now! These look so good. I took two of these to have with my coffee this morning. Very tasty.